Here at EpicPew, you’ll find the best movie, book, and media reviews to help grow and cultivate a deep and lasting faith that is truly Catholic. To encourage you on your journey, we give away books and media from our very generous sponsors and donors. Everyone is free to enter, but all are encouraged to explore the various items that are highlighted. This week we’re giving away 5 FREE copies of the Handbook of Catholic Apologetics by Dr. Peter Kreeft and Fr. Ronald Tacelli – a newer Catholic version of the popular Handbook of Christian Apologetics. Special thanks to our great friends at Holy Heroes for their giveaway support! Unbelievers, doubters and skeptics continue to attack the truths of Christianity.Handbook of Catholic Apologetics is the only book that categorizes and summarizes all the major arguments in support of the main Christian beliefs, including key distinctively Catholic doctrines. Also included is a Protestant-friendly treatment of Catholic-Protestant issues. The Catholic answers to Protestant questions show how Catholicism is the fullness of the Christian faith. 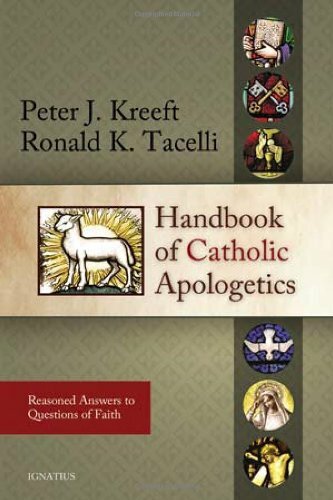 An expanded, Catholic edition of the popular book Handbook of Christian Apologetics,Handbook of Catholic Apologetics is full of the wisdom and wit, clarity and insight of philosophers Peter Kreeft and Ronald Tacelli. This is an informative and valuable guidebook for anyone looking for answers to questions of faith and reason. Whether you are asking the questions yourself or want to respond to others who are, here is the resource you have been waiting for.